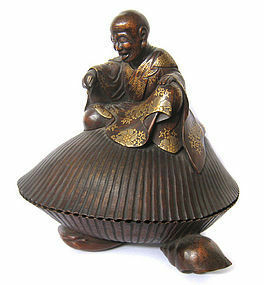 Japanese box made of boxwood carved in the shape of a giant clam shell upon which sits an arhat. His robes are beautifully decorated with gold maki-e lacquer. He holds a sharp tool as if he may attempt to open the enormous shell. Meiji Period (1868-1912). 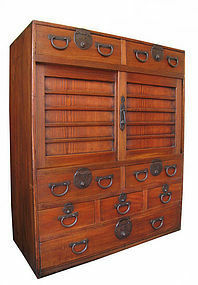 #k-3 Japanese tansu hardware handle, made of iron with black coating, square style, comes with back plate, handle, and two pins. Back plate: 4 1/4" wide. Handle: 2 5/8" wide. Total height: 1 1/4" high. #k-2 Japanese tansu hardware handle, made of iron with black coating, square style, comes with back plate, handle, and two pins. Back plate: 5 1/8" wide. Handle: 3" wide. Total height: 1 1/2" high. Antique Japanese 2-section curio cabinet, ornately carved with phoenixes and flowers, 6 shelves of various sizes, one compartment with door decorated with carved and inlaid scene of small bird in tall grasses hunting insect with unusual blue lacquer ground. 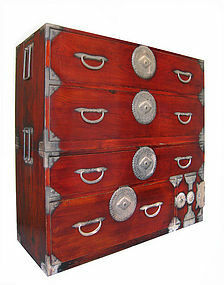 Below are two drawers also with carved and inlaid flowers on blue ground. Meiji Period (1868-1912). Size: 62" high x 35" wide x 16 1/2" deep. Meiji period, 1868-1912, medicine konban made of wood, incised characters painted with gold. #1 Eye Medicine - Seikisui (Japan's first eye medicine developed by Kishida Ginko, Rakuzendo from a formula learned in America by Prof. Hepburn) Tokyo, Ginza, Seal reading The Kishida. #2 Superb Effectiveness Hotan. Three cartouches on back. Two gold and red cartouches on front. It measures 27.5" tall, 9.5" wide, 1.2" deep. Overall excellent condition. 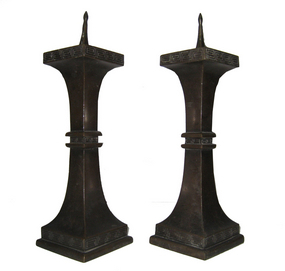 Antique Japanese Bronze candle stick decorated with incised key lock pattern on base, middle and top. Meiji period 1868-1912. They measure 3.5" wide at base, 12" tall. 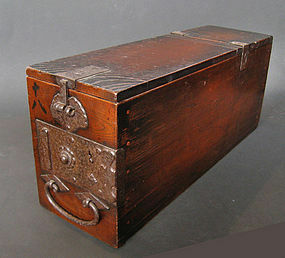 Unusual Edo period safe box, 1800-1850. Original hardware and finish. Kiri leaf design on hardware with mon character, original hand forged hardware. Number 18 on front of box. Box made to be carried there is an inset handle on the back of the box. 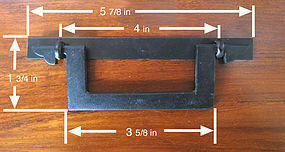 It measures 20" long by 6.25" wide by 8" tall.